7260, 7270, 7280, 7380, 7600, 7610, 7650, 7710, 8210, 8250, 8310, 8800, 8850, 8910, 9300, 9300i, 9500, E60, E70, N-Gage. 6230i, 6260, 6310, 6310i, 6510, 6600, 6610, 6610i, 6630, 6650, 6670, 6680, 6681, 6800, 6810, 6820, 6822, 7110, 7200, 7210, 7250, 7250i. CAN BE USED FOR NOKIA, MOTOROLA, SONY ERICSSON ETC. Original nokia phone charger. Small pin. Condition is Used. Dispatched with Royal Mail 2nd Class. ORIGINAL/GENUINE NOKIA PRODUCT. See details below. These are for the older style nokia phones with larger pin connection. The have the little Velcro fastener. DC8V at 300mA. Hand Winding. Compatible with NOKIA 1100. They are made of very strong plastic, but can be broken if you attempt to wind. I do this for. Depth =. Width =. 7260, 7270, 7280, 7380, 7600, 7610, 7650, 7710, 8210, 8250, 8310, 8800, 8850, 8910, 9300, 9300i, 9500, E60, E70, #. 6230i, 6260, 6310, 6310i, 6510, 6600, 6610, 6610i, 6630, 6650, 6670, 6680, 6681, 6800, 6810, 6820, 6822, 7110, 7200, 7210. Thick larger 3.5mm pin for old Nokia phones. UK three pin plug. Long 1.8m cable. 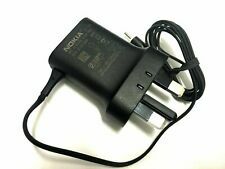 Genuine Nokia Mains Wall Charger ACP-12X Thick Big Pin For Old Phones. Condition is New. Dispatched with Royal Mail 2nd Class. 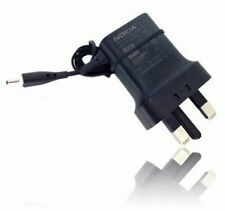 Genuine nokia charger small pin. A Beauty. Just Found In An Old Filing Cabinet. Condition is Used. Dispatched with Royal Mail 1st Class Large Letter. 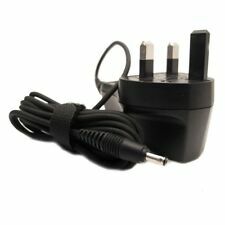 New Mains Wall Charger for Nokia (Thick Big Pin) For Nokia Old Phones. Condition is Used. Dispatched with Royal Mail Signed For® 2nd Class. Nokia CA-44 Charging Adaptor Use an old Nokia (large-pin) mains/car charger with a newer (small-pin-charged) Nokia device, including C1-01 C3-01 C5-03 C6 C5 X2 X6. Condition is Used but in great condition and works perfectly. Dispatched with Royal Mail 2nd Class or 1st class, your choice. 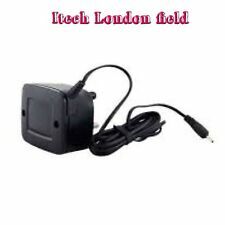 Connects directly to UK mains power socket: 240v/50-60Hz/180mA Output: 5.0v/800mA (3 pin plug UK specification). Nokia 1100, 1101, 1110, 1112, 1600. Nokia 2652, 2100, 2300, 2310, 2600, 2610, 2650. Nokia 3510, 3510i. Which is not compatible with 110V in USA. Original Nokia. Good Condition. the one in the pictures. If the pictures were taken on the green board - Every square equals to 1 cm. Nokia ACP-12X Charger - Excellent Condition For Old Nokia Phones. Dispatched with Royal Mail 2nd Class. Never used like new . DC8V at 300mA. NOKIA 3210 (plus other older Nokia models, below). 3210 3220 3230 3300 3310 3330. Straight end is a `older` NOKIA style 3.5mm jack plug. FULL list of COMPATIBLE NOKIA MODELS Cable is 75cm long.